Cirque Du Soleil Alegria at the St. Pete Times Forum Trivia Giveaway Tomorrow! Hey there folks! Boy have I got some good news for you guys today about an event that will be here in Tampa before you know it! 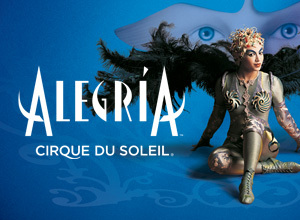 If you haven&apos;t heard the news just yet, the performers of Cirque Du Soleil Alegria will be in Tampa at the St. Pete Times Forum from June 22 - 26, 2011 for eight performances only! Alegría is a Cirque du Soleil classic and an internationally acclaimed production that has entertained more than 10 million people worldwide. "Alegría" is a Spanish word that means happiness, joy and jubilation and features an international cast of 55 performers and musicians from 17 countries and showcases breathtaking acrobatics. I had the opportunity to go and see Cirque Du Soleil Saltimbanco back in 2009 and it was such an amazing show, I will definitely be in attendance for this one! As always, we are gonna give a few lucky winners (4 to be exact) a chance to win some tickets to these amazing performances tomorrow and Wednesday of this week! Stay tuned tomorrow around noon where we will post the trivia giveaway questions on this blog! Regardless of whether you win or not though, tickets for the general public are still available at www.cirquedusoleil.com/alegria or by calling 1-800-745-3000. Trust me when I say this is one show that you don&apos;t want to take a chance and miss! That&apos;s all I got for now folks, but be sure to stay tuned in for more updates on things to do in Tampa Bay and Tampa Bay area events!